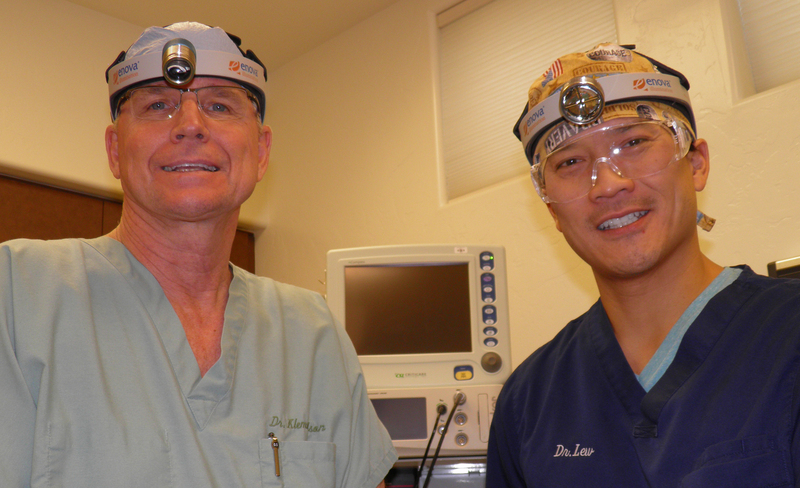 Dr. Daniel Klemmedson (left) wearing his Cyclops XLT-125 with Dr. Lew, his partner who now uses Dr. Klemmedson’s Iris S-100. Daniel Klemmedson, DDS, MD, is part of the team at Associates in Oral & Maxillofacial Surgery in Tucson, Arizona. Shedding Light asked him about his recent Cyclops XLT-125 LED surgical headlight purchases, which now supplement the other two Enova headlights he owns. 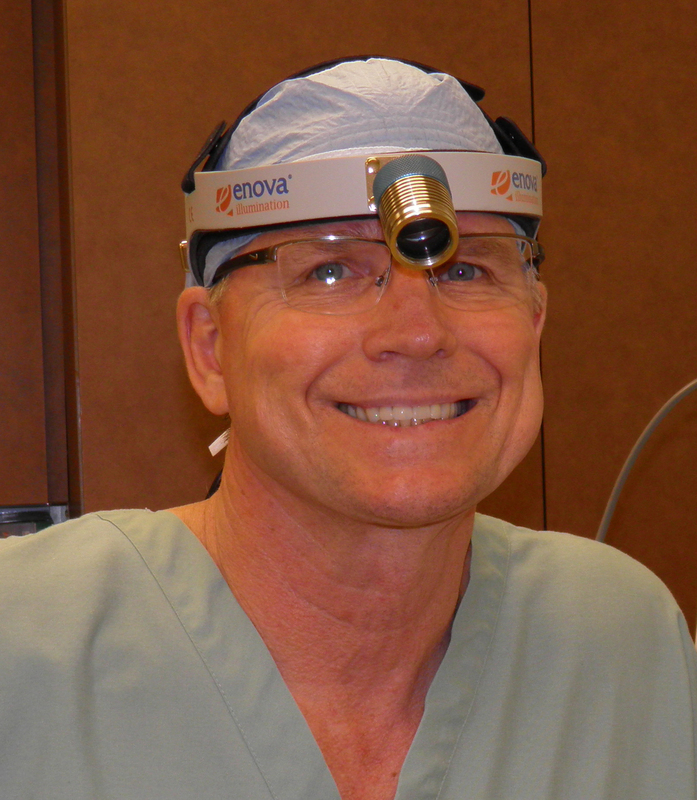 Dr. Klemmedson began using Enova’s very first headlight, the Halo, and has added newer Enova models to his practice over the last decade. Shedding Light: Tell us about your medical background. Where did you study medicine? Why did you enter the field? Dr. Klemmedson: I knew I would become a dentist when I was in the 8th grade. I spent too much time in a dental chair to not realize what a great profession it would be. I grew up in Tucson and attended the University of Arizona before heading to Los Angeles for my dental, medical and surgical training. I received my dental and medical degrees from the University of Southern California (USC) and completed my oral and maxillofacial surgery residency at Los Angeles County/USC Medical Center. Shedding Light: Where is your practice located? What is the focus of your practice? What conditions do you treat? Dr. Klemmedson: I practice in Tucson and have been in a small group practice for 30 years. Our office services range from care for wisdom teeth, dental implants, corrective jaw surgery, facial trauma, TMJ disorders, sleep apnea, anesthesia, bone grafting, pre-prosthetic surgery, oral and maxillofacial pathology, and cleft lip and palate. When I’m in the office, I spend the majority of my time performing dentoalveolar and implant procedures, but my hospital practice includes cleft lip and palate, orthognathic, pathology and trauma as well. Shedding Light: How has your practice changed over the years? Dr. Klemmedson: Though changes to my practice have not been significant over the years relative to what I do, changes in healthcare in general—technology, electronic records, regulations, third party financing and patient desires—have created incentives to modify practice procedures and areas of concentration. Shedding Light: What technology would you say has changed or advanced dentistry/oral and maxillofacial surgery? Dr. Klemmedson: I think imaging and materials—both biologic and non-biologic—have had the greatest impact on dentistry. Things like 3-D imaging, virtual surgery and 3-D printing have made us more precise. Implant materials continue to improve and grafting products and technics have expanded our options tremendously. Dr. Klemmedson: I cannot do what I cannot see. I have used a surgical headlight since I was in residency training. It lets me direct light to the critical areas of concern without thought or effort. I have probably extended my career by avoiding endless overhead light adjustments and unnatural head, neck and back manipulations necessary to visualize the surgical field with mounted light. The XLT-125 provides very good, bright light. It is comfortable, easy to put on and adjust. The battery life is excellent. I often wonder why I have multiple batteries as I rarely need to change midday. It is easy to transport. I carry it with me whenever I am on hospital call. I take it to off-site clinics, to the OR and on rounds. Shedding Light: You mentioned that you have the Halo, the Iris S-100 and two XLT-125s. How did you hear about Enova Illumination headlights? Dr. Klemmedson: I discovered Enova in an exhibition hall at an annual meeting. I was always looking for the brightest and most mobile headlight. Enova’s Halo LED surgical headlight was my first. I still use it every day. It remains the most mobile due to the lack of a cord and belt battery and the weight was never an issue. I purchased the Iris S-100 because of a second office and longer cases where a little less weight on the head was an advantage. Shedding Light: Why did you choose to upgrade to two Cyclops XLT-125 headlights? Dr. Klemmedson: I bought the first XLT-125 because I was travelling to an additional office and had a new associate who “borrowed” my headlights frequently. Our office is large and having a light source handy in several locations is a timesaver. The second one was purchased after the new associate became a partner. I gave him the Iris. Shedding Light: How did you like the XLT-125? What do you like best about the headlight? Dr. Klemmedson: The XLT-125 provides very good, bright light. It is comfortable, easy to put on and adjust. The battery life is excellent. I often wonder why I have multiple batteries as I rarely need to change midday. It is easy to transport. I carry it with me whenever I am on hospital call. I take it to off-site clinics, to the OR and on rounds. Shedding Light: How long each day do you wear the headlight? How would you describe its ease of use and comfort? Dr. Klemmedson: I probably wear my Enova LED headlight four to five hours every day. I use it to perform all surgical procedures and when making consultations. Shedding Light: Would you recommend Enova LED surgical headlights to other surgeons? Dr. Klemmedson: Yes. I use an Enova LED headlight everyday. I could not do what I do without it. I have had many tethered headlights, many more expensive and all have eventually failed and required costly repair. I have yet to have a failure of an Enova product. The batteries for the Halo, which is ten years old, have to be charged more frequently, but other than that, I’m very happy. Visit the Enova website to see all of the 10th Anniversary Celebration activities. We invite you to check out our new coaxial LED surgical headlight, new digital battery packs, our Sweepstakes Contest for the chance to win a new Enova headlight, our Top 10 Stories, and our history of enovation since 2005!